We arrived at Brands Hatch for the finale of the 2016 Dunlop MSA British Touring Car Championship with everything to play for with us having two of our Silverline Subaru BMR Racing drivers in championship contention. Colin was sitting 7th in the table just 37 points behind the championship leader Sam Tordoff and Jason in 8th a further 21 points adrift. The first point of the weekend would be awarded to the pole sitter during the most important qualifying session of the year on Saturday afternoon, and as dark clouds loomed overhead it wasn’t going to be straight forward. The track was initially dry as the cars left the pit lane for the 30 minute shoot out that lay ahead, with Jason instantly placing himself 2nd on the leader board. There was a stoppage due to Aron Smith’s car rolling onto its roof at Hawthorns, which in turn allowed the wet weather to set in when the circuit went live for the second time. With Colin in 17th and Warren and James further down the order there was concern that the drivers wouldn’t be able to increase they current times with the track conditions. The cars returned to the track and did all they could to get temperature in the tyres in a bid to try and increase their lap times. The rain then halted and the track started to dry but with the clock ticking we were under pressure to get up the order and into a better grid position for the first race of the day. Colin then put in a storming lap which was more than a second quicker than his competitors and lap after lap he increased his time to ensure that he held onto pole position. Jason didn’t manage to get a clean lap but impressively still managed a time quick enough to put him in a great 4th position. James set the 22nd quickest time with Warren just behind him in 23rd. Post-qualifying Tom Ingram’s Toyota failed the ride height check and his times were disallowed forcing him to the back of the grid and moving our drivers up one place, with Jason now starting behind Colin on the grid for the first of Sunday’s three races. As the lights went out for the first race of the day, the Subaru Levorgs made great starts, as did Rob Austin from 2nd in the front wheel drive Toyota which left Colin immediately fighting for the lead, which he remarkably held onto, as Jason went on the attack to find a way past, eventually safely slotting in behind in 3rd with both James and Warren also getting a good safe start on the opening lap. Colin created a gap to Austin as he fought off Jason who in turn was having to defend the MG of Josh Cook. The gap increased even further for Colin as did his lap times with him setting the fastest lap of the race on lap 7 gaining one more valuable point. As the checkered flag fell it was Colin who crossed the line after a lights to flag victory tallying up a staggering 22 points in the process, the maximum achievable and now in 5th for the driver’s title and just 20 points off leader Tordoff. Jason lost out to Cook on the final corner and brought the car home in an all-important 4th place gaining 13 valuable points in the process. Unfortunately it wasn’t enough to keep Jason’s hopes of a third driver’s title alive. James finished the race in 23rd place as Warren endured more bad luck from a puncture that dropped him down the order, followed by an off into the gravel trap which he didn’t recover from. For race two both Colin and Jason gained additional success weight due to their finishing positions and with both cars being on the soft tyre, there was a whole new set of challenges. As the lights went out both drivers up front made a great getaway with Jason immediately going on the attack of Austin, as James and Warren moved up the order to 20th and 22nd respectively. By lap two Jason was right on the tail of Austin looking for a way past the Toyota which enabled Colin to run away with the race up front. The second safety car of the day was then deployed after a dramatic crash into the tyre wall on the run down to Graham Hill by title contender Matt Neal in the Honda which subsequently took him out of the competition after he suffered concussion and bringing an end to his day. There was then a lengthy stoppage which allowed the drivers to take a breather. When the race restarted Colin made a break again out in front. 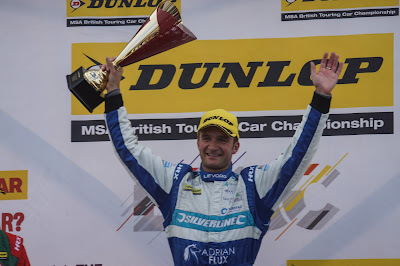 Jason made the move on Austin at Surtees and into second and Gordon Shedden, who was also in contention for championship honours, followed him through in the Honda and was now behind in third. Jason then closed the gap to his team mate Colin to just 0.8 seconds and was gaining on him with every lap when the team then asked Jason to hold station and act as rear gunner to Colin. Jason rose to the challenge keeping Shedden at bay and in turn made Colin’s job easier to escape into the distance and enabling him to take race honours once more as they brought the Subaru Levorgs home with a 1-2 for the team with Jason in 2nd. James brought his Levorg home in 20th with Warren in 23rd. 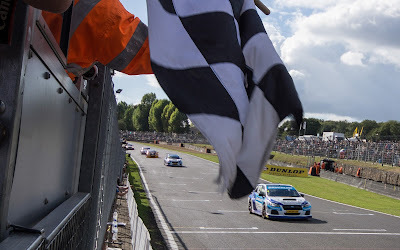 It was now a three way fight for the championship with just one race to go and Sam Tordoff in his BMW still in the lead, Gordon Shedden in the Honda in 2nd just two points behind and Colin in 3rd and 10 points adrift of the leader. The reverse grid draw was made for the final race of the 2016 season by Micky Butler from title sponsor Dunlop UK who he drew the number seven from the barrel which placed the final championship contender Mat Jackson on pole position, placing Jason in 6th and Colin in 7th. For race three Colin had maximum weight on the car for the second time of the day it was going to be a big ask for him to get past his fellow contenders and into a position of being in the championship lead but he was up for the fight and was prepared to do all he could to finish his season in the best position possible. Jason got a great start and instantly tried to get past the Honda of Shedden but it just wasn’t possible whilst Colin was held back in traffic trying to get a clean start and dropped to 10th position. Both James and Warren both got away without incidents and James was up to 17th with Warren running in 21st. The safety car however was then deployed for Warren after contact from Dan Welch sent him into the gravel ending his race prematurely. Racing resumed once again and the three remaining Levorgs held their positions with Jason finishing in 10th, Colin 12th and James 16th. 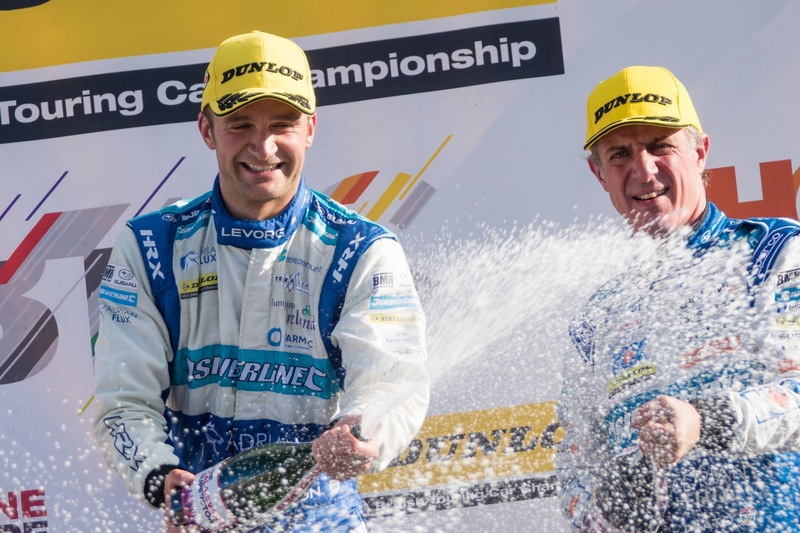 Jackson in his Ford took the race win, with Aiden Moffatt in second and Gordon Shedden took third and the title of 2016 British Touring Car Champion for the third time in his BTCC career. . Ultimately it wasn’t enough to get us to the top and Colin finished fourth in the championship with Jason ending his 2016 campaign in 7th. What a year!!!! 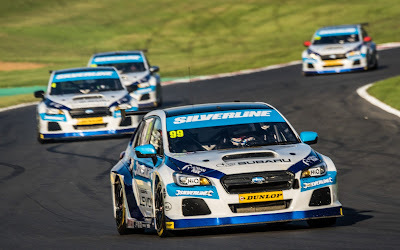 All of us at Silverline Subaru BMR Racing would like to take this opportunity in thanking Subaru UK and all of our sponsors for their support over the course of the 2016 season and to also thank the team who have put in lengthy hours of hard work to ensure that we fought a great fight in the championship. Thanks also to the army of loyal fans who have supported us through thick and thin this year, your support is second to none. We mustn’t forget the TOCA officials, marshalls, grid girls, photographers and last but not least Fat Goose Catering who have looked after both us and our guests superbly once again this year, huge thanks to you all. We now go into the winter break with an extensive winter testing programme planned as we set to embark on the 2017 season ahead, and I think it’s safe to say we are hungrier than ever for that title! 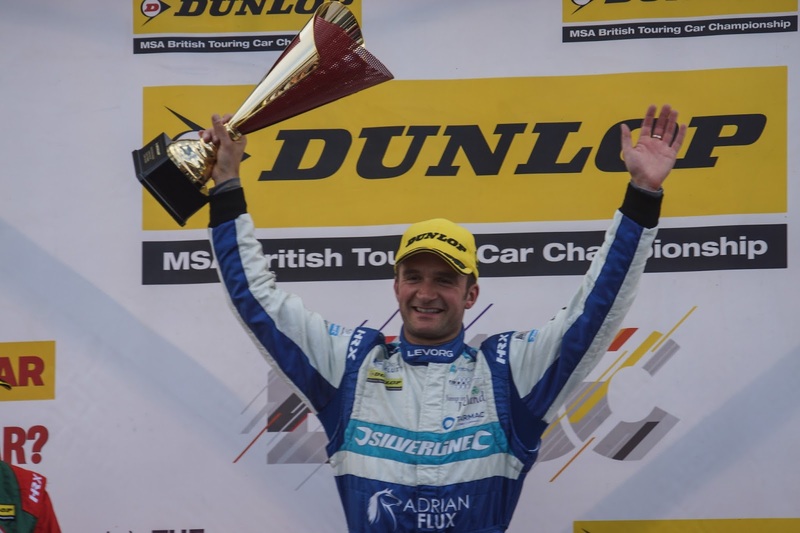 “Huge thanks to Subaru UK, all our sponsors and everyone in the team, the results speak for themselves and are proof of how hard everyone has worked to make it all possible. “We will continue to develop the cars over the winter to ensure that we come out even stronger for the 2017 season”. 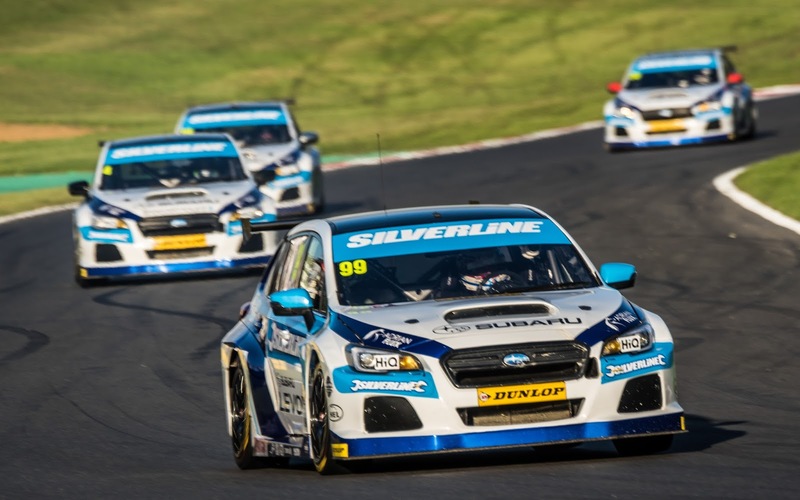 “Our Silverline Subaru Levorg's were once again the class of the field on the demanding Grand Prix circuit and produced fantastic results for the team. “I would like to thank the whole team on an amazing job. A special thank you to my three fantastic team mates for all their help and encouragement throughout the year. I’m so excited to see what 2017 brings!! !